Temporary exit of Greece: it’s an illusion. The notion of temporary exit from the Eurozone is a nonsense. It is just a way for Germany to push Greece out definitely. Out of the Euro Area and willing to come back implies that a country has to dramatically reduce the imbalances that led to its temporary exit in a environment which will not be the one of the common currency. With its new currency its interest rates would be much higher. Efforts to be made to satisfy Eurozone criteria would be too important. The temptation would then to make efforts to take advantage of the devaluation of the currency in order to reshape the economy. In other words a temporary exit is a polite manner for Germany to “fire” Greece definitely. 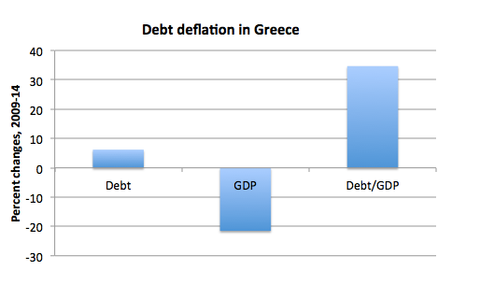 But would Greece be an isolate case or the first of a long list? The ratio of public debt to GDP is amazing when it is decomposed. GDP since 2009 was down by more than 20%. During this period the debt has not grown so much. We can then understand that the debt relief discussion that will come after the agreement on yesterday’s proposals by Tsipras is just a counterpart of this persistent austerity. The program, which has been presented by Alexis Tsipras to the troika, reflects the will to catch an agreement as soon as next Sunday during the meeting of the European Chiefs of government. Measures are expected to be approved in order to keep Greece in the Euro Area. Its aim is to get EUR 50bn on three years in order to repay Greek’s debt. 1. We met tonight to discuss the serious situation in Greece. We noted that the euro area authorities stand ready to do whatever is necessary to ensure the financial stability of the euro area as a whole. 2. Following the Greek referendum, Prime Minister Tsipras committed to present a new request for a programme within the framework set by the ESM Treaty, including strict policy conditionality. 3. We agreed to urgently examine whether it is possible to establish a basis for finding an agreement that respects existing commitments and our common rules. 4. The Greek government will on Thursday 9 July at the latest set out in detail its proposals for a comprehensive and specific reform agenda for assessment by the three Institutions to be presented to the Euro Group. 5. The Heads of State or Government will meet on Sunday 12 July. Let me add a few words from my own perspective. All sides of the negotiations share the responsibility for the current status quo. That is why today I called on all leaders to try to find consensus, which will be our common success, with no losers or winners. If this does not happen it will mean the end of the negotiations with all the possible consequences, including the worst-case scenario, where all of us will lose. Our inability to find agreement may lead to the bankruptcy of Greece and the insolvency of its banking system. And for sure, it will be most painful for the Greek people. I have no doubt that this will affect all Europe also in the geopolitical sense. If someone has any illusion that it will not be so, they are naive. The stark reality is that we have only five days left to find the ultimate agreement. Until now, I have avoided talking about deadlines. But tonight I have to say loud and clear that the final deadline ends this week. All of us are responsible for the crisis and all of us have a responsibility to resolve it.